After learning witches are made of wood, peasants in Monty Python and the Holy Grail, are asked what, besides wood, floats. One peasants asks hopefully: “tiny rocks”? Well there are ways for rocks and other heavy cargo to float, and floating across the world’s oceans today are millions of tons of steel and aluminum forged and smelted in China. By ship is by far the least expensive way for steel to travel from producers to consumers. Shipping costs from China to Californi a are lower than shipping by rail from steel mills in Pennsylvania, Ohio, and Indiana. So coastal Chinese steel and aluminum producers can have a significant cost advantage along America’s west coast, and can be competitive in markets in other coastal cities. High taxes (tariffs) on imported aluminum and steel can save companies and jobs in domestic steel and aluminum industries, but are costly and job-destroying for U.S. manufacturers who depend upon these raw materials for their production processes. U.S. officials said a Chinese aluminum magnate is sidestepping U.S. trade sanctions, the latest development in federal attempts to rein in a flood of cheap metal imports that have overwhelmed U.S. producers. The reporters uses says “cheap metal imports” are “flooding” the U.S. 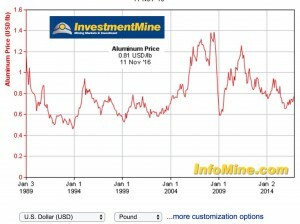 Here though is an InvestmentMine chart showing 25 years of aluminum prices. Looks like aluminum prices have been going up and down over the years, with a surge in 2006-2008, followed a steep fall in prices with the financial crisis of 2008-2009, and prices surging after, then falling again. When aluminum prices are high, producers make huge profits and tend to invest some of those profits in expanding output. As new capacity boosts supply, prices are pushed down, leading aluminum companies to reduce production but also to complain to Congress and the Department of Commerce about “dumping” by foreign firms. Two points to keep in mind about imports of aluminum, steel, copper and other metals. First, as key raw materials to U.S. manufacturing, lower metals prices help U.S. manufacturers stay competitive. With steel prices up 70% so far in 2016, U.S. manufacturers face higher costs and often raise prices, making their goods less attractive to consumers. Firms trying to absorb much higher raw materials costs have less margin for raising wages, capital investment, and dividends. U.S. Steel’s campaign to exclude Chinese steel imports would make U.S. companies that manufacture products from steel less competitive, steel users told a federal agency. They also said domestic steelmakers either don’t want to make some of the steel they need or can’t make it as reliably as Chinese suppliers do. 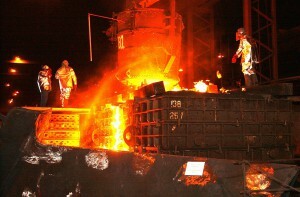 Baosteel is one of the Chinese producers targeted by U.S. Steel. Neal Lux, president of Global Tubing, said the Dayton, Texas, company worked with an unnamed U.S. steelmaker to provide steel used to make tubing for the energy industry. “The results were disastrous,” he wrote. The Antidumping and Countervailing Duty Operations Unit is responsible for enforcing U.S. antidumping duty (AD) and countervailing duty (CVD) laws. AD/CVD Operations conducts investigations in response to petitions received by the Department from domestic industries and/or labor unions. AD/CVD Operations also conducts subsequent proceedings known as administrative reviews in which importers’ actual duty liability is assessed. 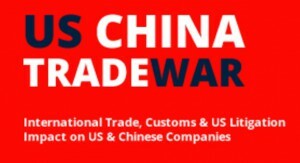 The Commerce Department in 2010 had punished China Zhongwang and other Chinese producers with tariffs as high as 374.15% after finding they were receiving illegal subsidies and dumping, or selling products in the U.S. below market prices. Chinese firms receive subsidies from local, regional, and national governments in China. But so do many U.S. firms. General Motors and Chrysler were bankrupt in the financial crisis and bailed out by the U.S. government (along with various insurance and investment firms). U.S. aluminum production benefits from inexpensive electricity from federally-funded dams in the Pacific Northwest. State governments provide tens of millions in subsidies for new auto plants and other factories, plus spend millions on road and rail infrastructure to help these goods reach international markets. You may not know Alcoa by name, but there’s probably at least one product with Alcoa aluminum in it somewhere in your home. As the world’s third largest producer of aluminum, Alcoa has an extensive history dating back to 1886 when it was first founded in Pittsburgh, Pennsylvania. The company has received $5.64 billion across 99 subsidies according to Find Good Jobs‘ report, which have helped the company go on to secure lucrative contracts for projects, like building jet engine parts. As of the past few years, Alcoa has really been picking up steam. Production has increased at its numerous plants and stock prices have jumped as investors have taken notice. As the company continues to ramp things up, look for subsidy levels to remain high in coming years. Businesses and industries often turn to government both for subsidies for their operations and for trade restrictions hampering foreign competitors. Chinese firms lobby for subsidies and trade restrictions much as U.S. firms do. Which firms receive the largest subsidies and the most effective/damaging trade restrictions, is a question for economists (and debaters) to research. But in all cases other manufacturing firms must deal with the challenge of higher prices and limited access to supplies needed for their operations. Firms in developed countries have integrated supply chains and Department of Commerce AD and CVD regulations throw wrenches in these supply chains. The next Administration has the option reduce or remove disruptive and costly trade barriers, as well as to set up new ones. Overall industrial output in the United States is at a historical high, while manufacturing employment is at a historical low. As it happened with agriculture more than a century ago, technological progress, which leads to productivity gains, is to be blamed for the dearth of blue-collar jobs in the United States. Globalization only reinforces the underlying dynamics. Moreover, in a world of global value chains, where production is sliced and diced across the world, several imports from China, such as auto parts, steel, semiconductors, and plastics, are actually intermediate goods or raw material for U.S. exporters, meaning that they contribute to the value of the final good. Previous posts have reviewed arguments both for and against additional trade restrictions with China. Economists Tyler Cowen & Noah Smith at Bloomberg are “Debating Free Trade and the Populist Backlash” (November 1, 2016 1:16 PM EDT). … China joining the WTO had zero effect on U.S. tariffs against Chinese imports. But it did force China to cut weighted-average tariffs to 19.8% in 1996, down from 32.2% in 1992, according to World Bank estimates. They shrunk further to 14.6% in 2000 and 3.2% by 2014. Yet U.S. tariffs remained unchanged by China’s entry into WTO, staying between 2% and 3% on a weighted average. They found that China’s “aggressive restructuring led to the layoffs of 45 million workers between 1995 and 2002, including 36 million from the state sector.” If China’s entrance to the WTO was about “stealing jobs,” it certainly got off to a bad start. Even in the world’s most populous country, those tens of millions of lost jobs had a big effect. Those numbers might appear to suggest U.S. imports surged after 2001, but it was actually Chinese imports that exploded. China’s global imports jumped to 29.2% of GDP in 2005, according to the World Bank, up from 18.3% in 2001. Meantime, U.S. exports of goods to China quickly rose from $19.2 billion in 2001 to $69.7 billion in 2008, according to the Bureau of Economic Analysis. With services added, the U.S. exported $169.2 billion worth of goods and services to China by 2014. A decade later, U.S. imports were still 15.5% of GDP—the same as 2005. The fact that China’s share of U.S. imports was up and Japan’s down did not mean the U.S. was importing more. Japan shifted manufacturing to mainland China, building factories and training Chinese workers. So more goods flowed to the U.S. from these factories as imports of goods decreased from Japan. Indeed, although American exports to Japan have risen in recent years, American imports – particularly automobiles, consumer electronics and machinery – have risen twice as fast. Japanese officials say they feel lingering bitterness at the way they had to negotiate with the United States under the threat of sanctions, a principal tool of the Super 301 clause. Japan viewed the Super 301 action as coercive, unilateral and illegal. 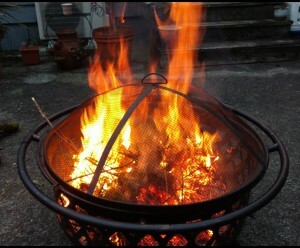 Mrs. Hills was understood to have been advised by many American negotiators not to use it again this year. The United States is no exception to the broader trend. The total value of U.S. imports and exports fell more than $200 billion last year. Through the first nine months of 2016, trade fell an additional $470 billion. Meanwhile, new barriers are rising. Britain is leaving the European Union. The WTO said in July its members had put in place more than 2,100 new restrictions on trade since 2008. New tariffs on imports are boosting steel prices in the U.S., offering a lifeline to beleaguered American steelmakers but raising costs for manufacturers of goods ranging from oil pipes to factory equipment to cars. So how much of the global slowdown in trade is due to falling construction and commodity prices, and how much is due to new U.S. and E.U. trade restrictions? The benefits of globalization have accrued disproportionately to the wealthy, while the costs have fallen on displaced workers, and governments have failed to ease their pain. Appelbaum claim certainly doesn’t apply to everyday people in China and other East Asian countries. 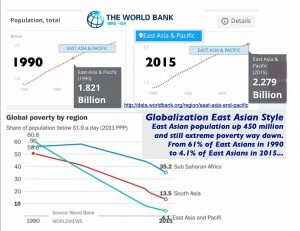 According to the World Bank “benefits of globalization” (international trade and investment) shifted billions out of extreme poverty. 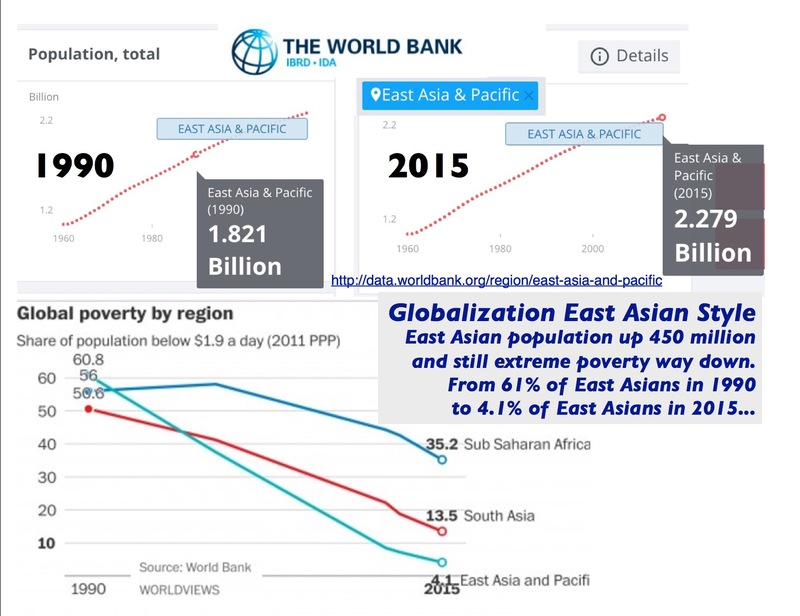 East Asia’s population grew from 1.821 billion in 1990 to 2.279 billion by 2015, yet the percentage of East Asians in extreme poverty (earning less than $1.9 a day) fell from 60.8% of the population in 1990 down to 4.1% by 2015. Maybe he just wanted to focus instead on the hundreds of East Asian business leaders now billionaires, and the tens of thousands millionaires. Inequality of income increased as economic and political entrepreneurs built tens of thousands of enterprises from small to large, and some to very, very large. We could research further the income gains Chinese workers enjoyed over the last 25 years vs. gains to Chinese and foreign company founders and stockholders. Still, everyday people saw stunning gains in income and living standards thanks to relatively open trade with the U.S., E.U., and the rest of the world. It’s hard to overstate how astonishing and rapid the decline in extreme poverty in the past couple of decades has been. 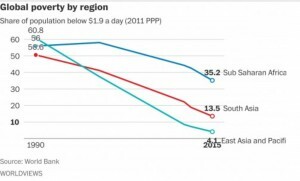 In 1990, more than a third of people on Earth lived on less than $1.90 a day, adjusted for local prices (this is the line the World Bank uses as its main metric). By 2013, barely 10 percent of people did; the rate had been cut by more than two-thirds. That’s one of the biggest and fastest improvements in human well-being in the history of the planet. During the 1990s, global trade grew more than twice as fast as the economy. Europe united. China became a factory town. Tariffs came down. Transportation costs plummeted. It was the Wal-Mart Era. Well, this is an overlong post already. But, in addition to the Cowen/Smith above, here are a additional responses to populist “Death by China” claims. Bryan Riley of the Heritage Foundation’s argues “Trade With China Is a Net Plus for Americans” (August 31, 2016). This Cato Institute Commentary “The Truth about Trade” (April 11, 2016) adds more support for the gains from trade.